Monday, March 26, 2018 ~ 10:30 a.m.
Sunday, March 25, 2018 ~ 5:00 – 7:00 p.m.
Darlene D. Streich, 91 of Greenwood, NE, passed away Thursday, March 22, 2018 at Havelock Manor in Lincoln, NE. She was born January 3, 1927 in Valley, NE to Cora Ann (Sawyer) and Harry Adams Sr.
She was united in marriage to Virgil Streich on November 15, 1953 in Fremont, NE. They moved to Greenwood and spent their years there and in Alvo. To this union, three children were born. Darlene was a homemaker and helped her husband on the farm. 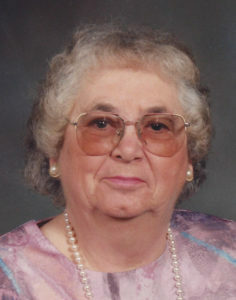 She was a lifelong member of the Ebenezer United Methodist Church in Murdock where she also participated in the United Methodist Women. Her first love was her family. She enjoyed watching sports, embroidery and playing Bingo. Survivors include her children, Beverly (Merle) Illian of Red Cloud, NE, Dorene (Jeff) Sillman of Alvo, NE and Kelvin (Kim) Streich of Greenwood, NE; eight grandchildren and 17 great-grandchildren; sisters-in-law, Vernabelle Adams of Valley, NE and Barbara Streich of Independence, MO; best friend, Shirley Feldt of Lincoln, NE; and many nieces, nephews and cousins. She was preceded in death by her husband, Virgil; parents, six sisters and four brothers. Kelvin: Sending sympathy to you upon the death of your mother. Thoughts will be with you and your family during the difficult days ahead. I’m thinking of you this week, and remembering so many things!! I’m glad you mentioned her love of Bingo!! We are thinking about you and yours thru this time of grieving for your Mom. Thoughts, prayers, love & hugs to you all.